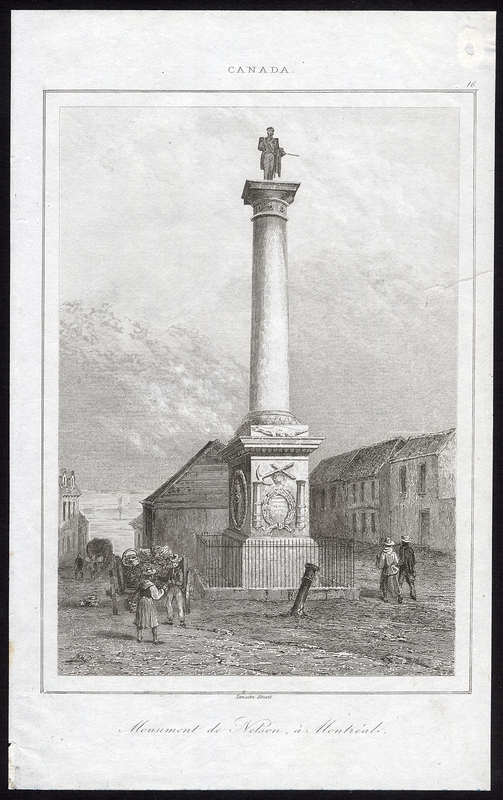 Subject: Plate: 'Monument de Nelson a Montreal'. This plate shows the Nelson Monument in Montreal, Canada. Condition: Good. General age related toning and light staining and/or soiling from handling. Some light creases. Small tear right side; repaired. Please study scan carefully. Medium: Steel engraving on a vellin type paper. Size (in cm): The overall size is ca. 12.5 x 20 cm. The image size is ca. 11 x 15.5 cm. Size (in inch): The overall size is ca. 4.9 x 7.9 inch. The image size is ca. 4.3 x 6.1 inch. Description: This original antique print originates from 'Histoire des Antilles. Et des Colonies Francaises, Espagnoles, Anglaises ..' by M. Regnault e Elias - J. Labaume - F. Denys - F. Lacroix, published by Firmin Didot in Paris 1849. Artists and Engravers: Lemaitre, Augustin Francois (1797-1870), French engraver and lithographer.